If you have the income to afford the finer things in life, then perhaps your mode of transportation should reflect your hard-earned social standing. Range Rover was the original luxury SUV, pioneering the segment long before SUVs were ubiquitous. Its technical sophistication and blend of on-road comfort and manners with off-road prowess and capabilities have simply grown through the years. The quality and ease of driving. I love the style, comfort and ease of driving my car. It handles like a dream. Turning radius is incredible. Parking and parallel parking is very easy in such a large vehicle. My only one complaint would be parking in parking structures I always feel like I am going to hit the ceiling. Great car but is extremely pricy to fix when it breaks! It's a nice luxury vehicle but to fix minor things on it costs an arm and a leg! Also, not everywhere works on them so you have to be willing to go to specific places and pay what they want. Excellent vehicle I am so glad I bought it. Excellent SUV but vehicle gas mileages is really bad. Nothing I see else wrong with the vehicle if I have something else to say negative is the airbag on that vehicle. Land Rover will notify owners, and dealers will replace the front passenger air bag assemblies, free of charge. Parts are not currently available. Owners will be sent an interim notification around March 3, 2017. A second notice will be mailed when remedy parts are available. Owners may contact Land Rover customer service at 1-800-637-6837. Land Rover's number for this recall is P082. Land Rover will notify owners, and dealers will replace the passenger frontal air bag assemblies, free of charge. Parts are not currently available. Owners will be sent an interim notification around July 31, 2016. A second notice will be mailed when remedy parts are available. Owners may contact Land Rover customer service at 1-800-637-6837. Land Rover's number for this recall is P081. 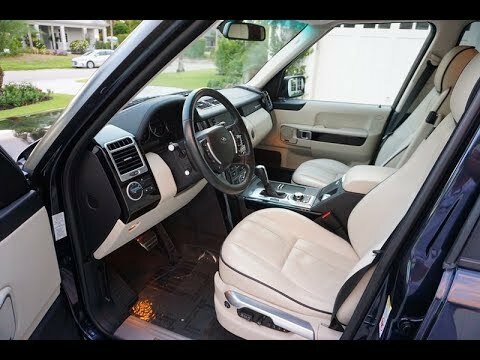 Jaguar Land Rover North America, LLC (Land Rover) is recalling certain model year 2006-2012 Land Rover Range Rover vehicles manufactured April 15, 2005, to September 4, 2012. One or both of the flexible front brake hoses may rupture causing loss of brake fluid. If one or both of the flexible brake hoses fails, the vehicle may require a longer distance to stop, increasing the risk of a crash. Land Rover will notify owners, and dealers will replace the left and right front brake hoses, free of charge. The recall is expected to begin March 13, 2015. Owners may contact Land Rover customer service at 1-800-637-6837. Land Rover's number for this recall is P054.